According to reports, the structures stretch for a staggering 76 miles at its furthest points. The formations found off the coast of Baja California include mysterious tube-like constructions that are roughly 2.4 miles in width. So far there are a couple of theories as to what the mysterious formations ould be. Among the most commented theories are that we are looking at an ancient system of roads and tunnels created thousands of years ago when water levels were much different. Others speculate that these are the remains of an ancient civilization and the tube-like structures visible on the ocean floor are most likely ruins of their temples. Skeptics, however, argue that none of the previously mentioned theories are acceptable and that we are probably looking at faults in the seabed. 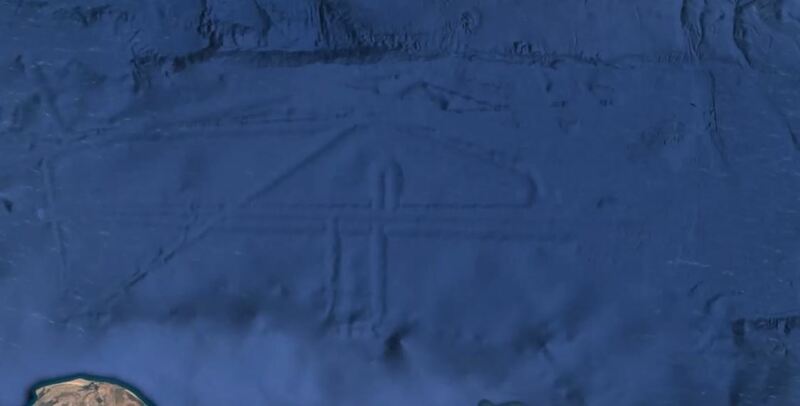 According to a video posted on YouTube by a user called Mister Enigma, the unusual structure cannot be the result of natural formations and that there is a definite resemblance between the underwater ‘structures and the famed Nazca lines located in Peru.’ The narrator of the video postulates a number of questions asking the audience who could have built such a complex set of structures? An Ancient Civilization? Or Aliens perhaps? Interestingly, not long ago, another ‘UFO hunter’ has found what appears to be a massive underwater Pyramid located off the coast of Mexico. The mysterious structure located off the coast of Mexico join the lust of a vast number of anomalies that have been discovered in the last couple of years. What are your thoughts? Is it possible that researchers have actually found the remains of an ancient city that is now located beneath the ocean?